from 11:30 A.M. to 1 P.M. Doors open 11 A.M. Lunch served promptly at 11:30 A.M.
LIVE STREAMING ON FACEBOOK LIVE from 12:10 P.M.
Exit west onto 6 th Avenue South and drive straight to Congress Ave. Turn right onto Congress Ave. Drive to the 2 nd light and turn right onto Lake Worth Rd. Turn right onto the access road at the first light to enter the college campus. Drive straight toward the Center for Bachelor’s Programs Building. Park in the Blue Parking Lot on the east side of the building. If you get lost, call Darlene on her cell: 561-573-6384 or 561-852-0496. $25 before Oct. 12, $35 after. Doors open 11 A.M. . Lunch served promptly at 11:30 A.M.
click the button below to go to our Calendar! Register for events at LWVPBC.org or by contacting Estelle Friedman at efriedman@bellsouth.net or (561)968-4123. VOTERS' GUIDE COMING IN MID-SEPTEMBER! The Speakers Bureau has announced Marcia Herman as the new committee chair. Outgoing Chair Ethelene Jones provided Marcia with well-organized files documenting communication, contact information and dates for future presentations by the committee members. Up until election day, November 6, 2018, the committee members will present the 2018 November Ballot Proposals presentation to over 100 Palm Beach County groups and organizations. The committee met Saturday, August 25, 2018 at the STEM Center in Dreher Park, West Palm Beach, to become familiar with this topic. To learn more about the August training and our new chair, click the button below. Amendment 4 Voting Restoration is on the ballot! Now we need everyone to VOTE! 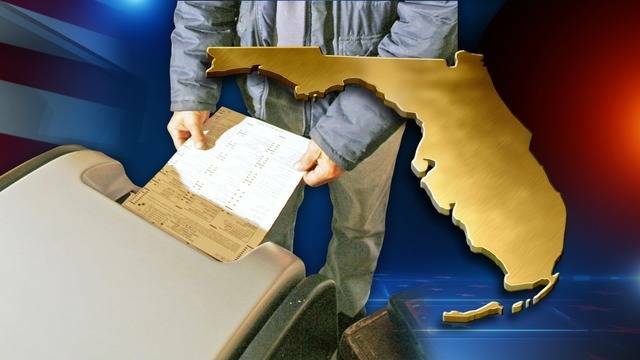 Help restore voting rights for 1.4 million Floridians! You can make calls, text or canvass. Log on to www.secondchancesfl.org . Second Chances has all the information you need to get going. Sponsored by the Voting Rights Coalition. How bad is the pollution? A garbage truck’s worth of plastic is dumped into our world’s oceans every minute. Where is it coming from? Plastic is appealing because it is cheap and versatile, but also virtually indestructible which makes it a nightmare to dispose of. Where does it all go? 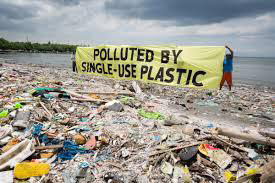 There are five massive patches of plastic in the oceans around the world, created by ocean currents. Is it affecting marine life? Many marine organisms can’t distinguish common plastic items from food. Are humans at risk? The evidence is unclear. ﻿ & Councilwoman Dr. Julia Botel of Riveria Beach. The midterm general elections are looming large. 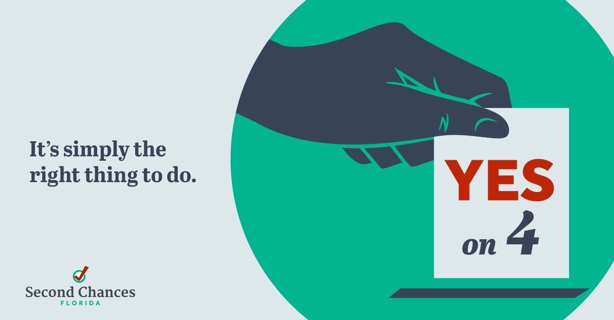 With the future at stake, voter registration and turnout are key to how local districts, states, and indeed, the country will govern going forward. 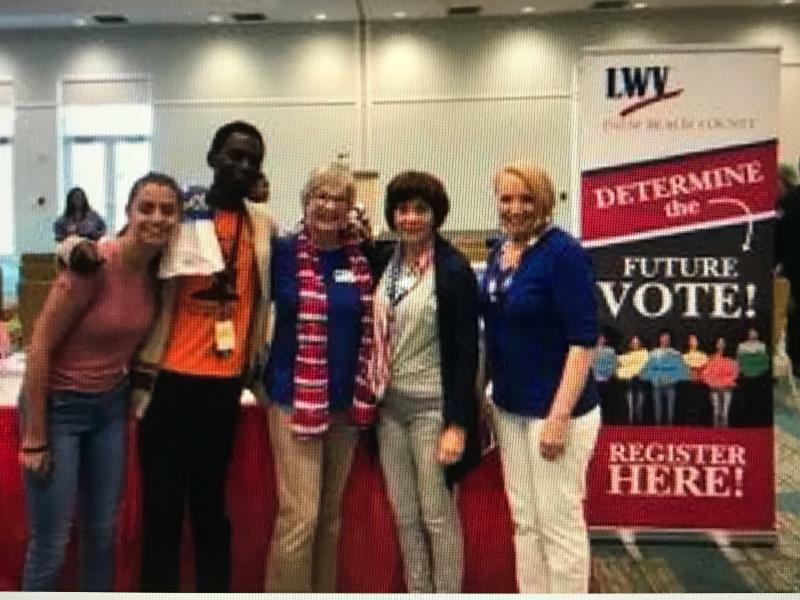 Palm Beach County municipalities and local colleges have asked for LWVPBC help in expanding voter registration in anticipation of the coming elections. The Voter Services Committee has a full schedule to meet this demand. Boca Raton, Greenacres and Lake Park have upcoming Back to School community events booked. Florida Atlantic University has requested our help for an event for the first week of school.Palm Beach State College Loxahatchee and Main campuses plus 2 campuses of Keiser University have requested help for Constitution Week. There will be multiple events on some days. Due to heavy demand for our help from now until the midterm elections, we need volunteers to serve as Team Leaders for events. Team leaders are responsible for getting all supplies needed to the site, supervising the volunteer registrars, double-checking the voter registration forms and making sure they get to the Supervisor of Elections Office in a timely manner. There will be a one hour training session for team leaders scheduled shortly. 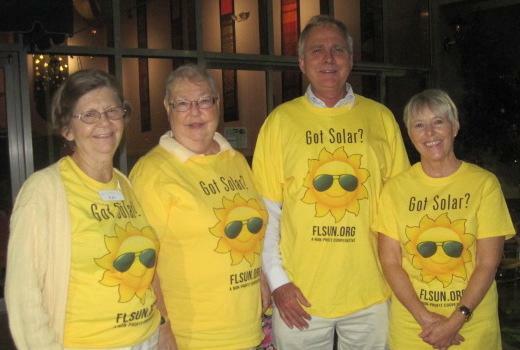 The Kick-Off of Palm Beach County's second Solar Co-op is scheduled for September 27 th at the Pine Jog Environmental Education Center on the corner of Jog Rd and Summit Blvd. The Pine Jog Environmental Education Center uses solar panels to supply energy to the center. Besides having politicians who believe in solar energy and partners who are helping with this project, we will have a speaker who converted to solar energy as part of the 1 st Solar Co-op in Palm Beach County. Jody Finver from Solar United Neighbors, the group partnering with the League of Women Voters Florida, will be there to answer any questions. Solar United Neighbors supplies the solar expertise needed to run the solar co-op. The first 2 Information Meetings will be held on October 13 th – from 10:30am to 12:30pm at the Gardens Branch Library in Palm Beah Gardens and from 2pm to 4pm at the Wellington Branch Library in Wellington. The next 2 Information Meetings will be on November 14 from 7pm to 9pm and December 8 from 10:30am to 12:30pm. Sites for these 2 Information Meetings are being reserved. The website solarunitedneighbors.org/palmbeach is available. It can answer many of your questions about solar co-ops and solar energy. The Solar Co-op closes at the end of the year. 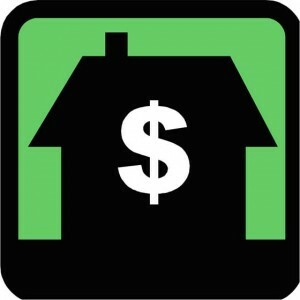 We hope that, if you have ever thought about converting to solar energy for your home, you will take advantage of the Solar Co-op in Palm Beach County. Hope or fear, better angels or worst impulses--for America, its people, and its politicians, the struggle continues. From Abraham Lincoln through Lyndon Johnson, Meacham describes concisely and eloquently times when this grand experiment almost broke--the Civil War and its aftermath, the rise again and again of the Ku Klux Klan, isolationism and America First, the Japanese internment, the Red Scare and McCarthyism, segregation...and more. 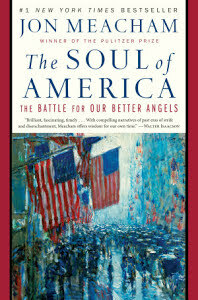 The Soul of America explores how reactions to these moments resulted in hopeful reforms. In each case, courageous, principled voices, from inside and outside, emerged to help the nation find its way out of meanness and toward a better version of itself. Leaders were never perfect, often were way too slow to act, sometimes made horrible decisions; but all learned from their mistakes and experiences, all were humbled by the great responsibility of the Presidency, and all, when pressed, acted with moral clarity toward a more perfect union, replacing fear with hope and choosing to embrace the better angels of their natures over their worst impulses. There are many reasons to read this book. It is a finely written history and a good reminder of where we have been as a nation--of what allows the dark underbelly to emerge and what forces the moral idea of America to strengthen and ennoble our actions. The epigrams and speeches woven through the narrative are inspiring, telling and worth attention. The parallels to our own times provide some perspective. Finally, one sees throughout the book, that, while leadership is critical, it is the people who have the ultimate authority. Meacham concludes by elucidating a set of necessary principles for democratic participation: ENTER THE ARENA; RESIST TRIBALISM; RESPECT FACTS AND DEPLOY REASON; FIND A CRITICAL BALANCE; and KEEP HISTORY IN MIND. We had a really successful training on Saturday at the School District's main office. We now have over 200 volunteers for the September 25th National Voter Registration Day event in the high schools. Sept. 25th in the morning there will be a breakfast, pep rally and last minute training review event at School District HQ on Forest Hill, after which everyone will head to their assigned schools for the lunchtime registration. PICTURED ABOVE: (L to R) Judy Edwards, School Board Member Erica Whitfield, Assistant Superintendent for Teaching and Learning, Kalinthia Dillard, Pam Maldonado, LWVPBC Voter Services Chair, and Shawn Henderson. Judy Edwards, Shawn Henderson and Kalinthia Dillard represent the West Palm Beach Chapter of The Links, Inc. Ms. Dillard is President of the chapter. 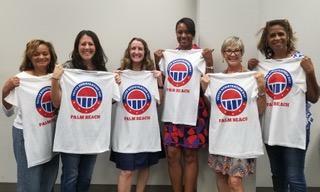 Our Board of Directors accepted the recommendation of our Education Committee to support and actively promote the proposed ballot issue of the Palm Beach County School Board that would add one percent millage rate to the property tax in the county. Currently, we pay .25%, which is used for arts and physical education. This existing provision will expire at the end of this year. The new proposal will be used for teacher salaries as well as arts and physical education. VOTER REGISTRATION: We are still training to register voters and registering voters. Contact Chair of Voters Service, Pam Maldonado at pamelamaldonado.mia.@gmail.com . The committee has a long list of sites throughout the county that have requested voter registration assistance. VOLUNTEERS are needed for event set-up and take-down for our Cool Topic presentations being held at the South Florida Science Center, STEM Building, in West Palm Beach. If you are willing to assist, please send you name and contact information to Mary Mertz at marymertz@me.com . Jo Ann Aebersold, Boca Raton; Elisabeth Arriero-Ferreira, Jupiter; Carole Beer, Boca Raton, Katie Carpenter, Palm Beach; Harriet Cohen, Boca Raton; Lana Cohen, Boca Raton; Sylvia J. Cohen, Boynton Beach; Patricia Davis, Palm Beach Gardens; Jannette Edwards ,Wellington; Jessica Edwards, Lake Worth; Marsha Feldman, Coconut Creek; Eileen Fleming, Palm Beach Gardens; Doris Hochheiser, Lake Worth; Lynette Kellogg, North Palm Beach; Sherry McDowell, Palm Beach Shores; Lorenne Marden, Palm Beach Gardens; Barry Minars, Boynton Beach; BettyAnn Monash, Boynton Beach; Jeri Muoio, West Palm Beach; Sally Oken, Boca Raton; Elizabeth Romfh, Jupiter; Abby Rosenblum, Lake Worth; Danielle Schwabe, Delray Beach; Gail Schwartz, Boynton Beach; Nadia Spivak, Palm Beach Gardens; Claire Teller , Boca Raton; Mona Weingarten , Delray Beach. LWVPBC name tags which were ordered prior to July 20th have arrived! Your name tags will be available at all upcoming Cool and Hot Topics events. If you prefer to have your name tag mailed to you, send a $5 check to LWVPBC, 9433 Worswick Ct., Wellington, Fl 33414 and notify dkostrub@aol.com or 561-852-0496. Thanks for your membership support!